Description: Wetherspoons pub with a modern, brightly lit bar but the seating areas with the patterned carpets and heavy curtains looks a bit dark and old fashioned. 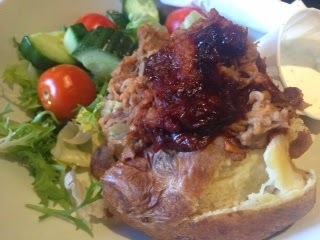 The food was: My jacket potato was quite disappointing as it was small and a bit dry, though the pulled pork filling was nice. 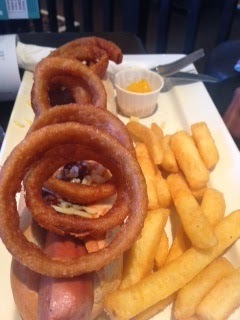 My parents enjoyed their food; the hot dog looked particularly good though it was very calorific. That's one thing I like actually - Wetherspoons now puts calorie counts next to every item on the menu and there is also a section of the menu for meals of under 500 calories. The atmosphere/service was: I felt like the pub had a bit of a dingy atmosphere which might be a bit unfair as I can't quite put my finger on why. The bar staff were perfectly polite and helpful. Price range/value for money: Excellent - Wetherspoons is extremely good value, with lighter bites priced very cheaply and other deals like two meals for £6.99; my dad's hotdog was only about £7 if I recall and it was an absolutely huge meal with the chips and onion rings as well. Would I recommend it? I am always happy to go to a Wetherspoons as I know there will be a huge choice on the menu with plenty of options for lower calorie meals and it's hard to find such good value for meals of this size. Having said that, I wouldn't especially recommend this particular pub as it just didn't strike me as particularly nice - it needs to be lighter and brighter somehow.